I recently had an email exchange with Edward Dusinberre, first violinist of the celebrated Takács Quartet, in anticipation of the Takács’ upcoming recital in Koerner Hall on March 25. I began by congratulating Dusinberre on his recent book, Beethoven for a Later Age (The University of Chicago Press, 2016), which I found to be a wonderful reading experience, rich in its multi-layered outlook and filled with keen insights into the string quartet experience in general and his in particular. The way he integrated the historical context of Beethoven’s own involvement with his quartets into the narrative was novel and instructive. And tying the history of the Takács to specific performances of specific Beethoven quartets was, I told him, an organic and deft touch. WN: Does the quartet still rehearse four hours at a time? How much rehearsal time per week? Your Koerner Hall concert on March 25 begins at 3pm. What effect will that have on your rehearsal process? ED: I’m glad you enjoyed the book! We rehearse between three to three and a half hours a day, five days a week when we are at home. On the road it’s more a matter of “maintenance” rehearsals, tweaking things here and there. The hard preparation work is done in Boulder. For an afternoon concert we usually meet two hours before the concert. Please speak about the importance of conveying emotion in the music. Conveying emotion is the end goal, but each audience member’s emotional response to a piece is unique. So we spend a lot of time discussing what character we want a phrase, section or movement to convey. The means for achieving that are of course many: bow stroke, type of sound, pacing, dynamic contrast, body language, etc. We hope if the characters are vivid and immediate, then the emotional responses they inspire will be stronger. How does the Koerner Hall acoustic influence your playing there? What a gorgeous hall and acoustic! Such a space creates the possibility for more varied dynamics and colours of sound: in particular it is more rewarding to play very quietly. Also timing can be affected. The last chord of a slow movement will fade beautifully into silence, where in a less good hall it might stop abruptly, so one is encouraged to linger. You wrote extensively about the interpretive challenges and your various approaches to Beethoven’s string quartets in your book. “Performing Opus 131 is always an adventure,” you wrote. And: “Of all the Beethoven quartets, Opus 131 is the most ambitious.” Please elaborate on those two statements. The emotional range of the piece is staggering. And often the juxtapositions of fiercely contrasting emotions require a nimble approach from the performers. For example, after a lyrical fourth movement full of whimsy and fantasy, one is hurled into a helter skelter scherzo which requires fast fingers and finesse. Immediately after that, the sixth movement is a lament, again with the minimum of time to prepare. The piece is an adventure because traversing such a range of emotions feels a bit different each time. What is your approach to Opus 131 today? How might it change on March 25 in Toronto? How does the energy of the audience bear on it? The opening bars of the piece are like the beginning of a long story. Sometimes the opening feels introspective, sometimes more overtly despairing. This is music that can accommodate many different approaches, just like a Shakespeare play. The purpose of rehearsing Opus 131 is to feel comfortable enough to be open to minute changes of character, balance and pacing that can occur spontaneously onstage. Beethoven modestly remarked that in this music there is “less lack of fantasy (imagination).” It is hard to predict from one concert to the next how our feeling about performing the piece will change but our job is to be open to how that fantasy may unfold. How would you characterize the two other works on your Koerner Hall program – The Haydn E-flat Major, Op.76 No.5 and the Shostakovich No.11 in F Minor, Op.122? The Haydn is a wonderfully varied piece with a luminous slow movement worthy of a late Beethoven quartet. The outer movements are full of surprises. The first movement starts rather gently before delivering a rambunctious coda. The last movement is full of high spirits, comic turns and pregnant pauses – one of our favourites. The Shostakovich is an extraordinary piece. Like Opus 131, the movements are played without a break. And like Beethoven, Shostakovich takes simple thematic material and transforms it in imaginative ways, creating a satisfying narrative arc. Speaking of Quartets (2): The Rolston String Quartet’s international profile has recently been raised even higher, having been selected as the recipient of the 2018 Cleveland Quartet Award, the first time a Canadian ensemble has received this prestigious biennial award which honours young string quartets on the cusp of a major international career. It is given out by the Cleveland Quartet, Chamber Music America and eight notable chamber music presenters across the United States. Winning quartets receive a concert tour of the United States, including performances at Carnegie Hall and the Smithsonian in Washington DC. The prize is the latest in a string of accolades for the fast-rising ensemble since winning the top prize at the 12th Banff International String Quartet Competition in 2016. Currently the fellowship quartet-in-residence at the Yale School of Music, the Rolstons now join the ranks of previous Cleveland Quartet Award winners Brentano, Borromeo, Miami, Pacifica, Miro, Jupiter, Parker, Jasper, Ariel and Dover Quartets. “Some people think of a string quartet as a 16-string instrument; others see it more as four individuals, with a very distinct identity and characteristics. We lean more toward the latter,” Rolston cellist Jonathan Lo said. Cellist Norman Fischer, an alumnus of the Concord Quartet and a specialist in contemporary music, explained that at Rice University, the Rolstons found a deeper way of listening. During their three years of study there, they developed “the ability to hear sounds in very specific ways, the ability to hear what’s going on with all the players around you – to be able to anticipate changes in the music, but also to be able to anticipate changes from one another and to quickly respond. This is really complicated perceptual training. The Rolston String Quartet plays at the Kitchener-Waterloo Chamber Music Society March 7, the Jeffery Concerts in London March 10, the Burlington Performing Arts Centre March 11 and the Royal Conservatory’s Mazzoleni Hall April 8. The programs will include combinations of Haydn, Beethoven, Debussy and Tchaikovsky in support of Schumann’s hugely popular Piano Quintet. The Eybler String Quartet came together in late 2004 to explore the works of the first century of the string quartet, with a healthy attention to lesser-known composers such as their namesake, Joseph Leopold Edler von Eybler. The group plays on instruments appropriate to the period of the music it performs. Violinist Julia Wedman and violist Patrick G. Jordan are members of Tafelmusik Baroque Orchestra; violinist Aisslinn Nosky is concertmaster of the Handel and Haydn Society and principal guest conductor of the Niagara Symphony Orchestra; Wedman and Nosky are also members of I FURIOSI Baroque Ensemble. Cellist Margaret Gay is much in demand as both a modern and period instrument player. Their March 9 Heliconian Hall recital includes early Haydn, late Mozart and their contemporary Franz Asplmayr (1728-1786). The Elias String Quartet has been together since they were students in Manchester in 1998. Music Toronto’s Jennifer Taylor brought them here in March 2015 for a memorable local debut which I chronicled in these pages: “French sisters Sara and Marie Bittloch on violin and cello set the tone for the quartet’s intimate sound and its impeccable sense of ensemble. Equally attentive were second violinist Scotsman Donald Grant and Swedish violist Martin Saving. Together the foursome brought heavenly pianissimos and wonderful silences that allowed Mozart’s music to breathe in his ‘Dissonance’ Quartet K465 and unrelenting anger and passion to Mendelssohn’s last string quartet without losing the ruminative lyricism of its slow movement.” Their upcoming recital for the Women’s Musical Club of Toronto on March 8 features three pillars of the repertoire: Schubert’s Quartettsatz, Janáček’s heartfelt String Quartet No.2 “Intimate Letters” and Beethoven’s mighty String Quartet No.12 Op.127. The following day the Elias performs the same program in Carnegie Hall. The Penderecki String Quartet, currently celebrating their 25th year as quartet-in-residence at Wilfrid Laurier University in Waterloo, returns to Music Toronto March 15 for a concert of Schumann’s String Quartet No.3, Kelly-Marie Murphy’s Oblique Light (2016), commissioned as a sesquicentennial project by the Pendereckis and meant to depict the quality of light in our northern land, and Elgar’s Quartet in E Minor Op.83, which captured the spirit of his country cottage where it was written at the end of WWI. As we go to press Music Toronto has announced their 2018/19 season. Highlights include two appearances by Marc-André Hamelin: a season-opening solo piano recital and a Valentine’s Day chamber music concert with the Juilliard String Quartet; and Cleveland Quartet Award winners, the Ariel Quartet, who make their local debut. Assorted Strings. The final concert of the Academy Concert Series season on March 10 sees the return of violinist Scott St. John and guitarist Lucas Harris, joining cellist Kerri McGonigle and violinist Emily Eng in a remounting of one of ACS’ most talked about and popular concerts from five years ago, “A Portrait of Paganini.” The repertoire will include a Paganini guitar quartet – he wrote 15 – his amiable Terzetto Concertante (for viola, cello and guitar) and one of his 24 virtuosic solo violin caprices. The Kitchener-Waterloo Chamber Music Society brings together the estimable Lafayette and Saguenay (formerly the Alcan) Quartets on March 25 for a rare evening of octets for strings by Mendelssohn, Niels Gade and Russian-Canadian composer Airat Ichmouratov. (Music Toronto will present the identical program March 14, 2019.) A completely different string confection will be served on March 31 when 5 at the First Chamber Music Series presents Arensky’s String Quartet No.2 for violin, viola and two cellos; Jocelyn Morlock’s Blue Sun for violin and viola; and Dohnányi’s String Sextet in B Minor. And a Pianist. Dénes Várjon, admired by professional musicians and European audiences but less well-known in North America, makes a return visit to the Jane Mallett Theatre on March 27 under the auspices of Music Toronto for a recital laden with music by his Hungarian countrymen Bartók and Liszt. It begins with Beethoven’s late Bagatelles Op.126, the composer’s final music for the piano. Beethoven described it as “Six bagatelles or trifles for solo piano, some of which are rather more developed and probably the best pieces of this kind I have written.” Fiona Maddocks wrote in The Guardian in February 2012 that Várjon’s ECM recording of Liszt’s Sonata in B Minor “demands attention for its grandeur, clarity and incisive virtuosity. Várjon makes rigorous sense of the work’s episodic structure, showing powerful ease in the fugue but enjoying the rhapsodic nature of the rest.” It will be exciting to hear him play it live. TSO and Friends. Stéphane Denève, recently appointed music director of the St. Louis Symphony (effective 2019/20) leads the TSO in Rachmaninoff’s Symphonic Dances, the composer’s last completed work. Fun facts: it was the first time Rachmaninoff wrote for the saxophone and he got advice from violinist extraordinaire Fritz Kreisler on string bowings. Also on March 28 and 29, versatile German pianist Lars Vogt is the soloist in Brahms’ ravishing Piano Concerto No.2. Born in Taiwan and raised in Australia, violinist Ray Chen won the Yehudi Menuhin Violin Competition in 2008 and the prestigious Queen Elisabeth [of Belgium] Music Competition the following year. Adept at social media and elegantly clad in Armani, Chen is the epitome of a modern musician. He is the soloist April 5, 7 and 8 in Bruch’s beloved Violin Concerto No.1 under Sir Andrew Davis, who also leads the orchestra in one of Mendelssohn’s programmatic concert overtures and Sibelius’ magnificent Symphony No.5. Then, on March 24, the TSO cedes the Roy Thomson Hall stage to the National Arts Centre Orchestra and its conductor Alexander Shelley for performances of a new work, Earworms, by Vivian Fung, Brahms’ serene Symphony No.2 and Shostakovich’s lively and sardonic Piano Concerto No.2 (with Russian-born Israeli pianist Boris Giltburg, winner of the 2013 Queen Elisabeth Music Competition). The Associates of the Toronto Symphony present “The Companion’s Guide to Rome” on March 26, featuring Amanda Goodburn, violin, Theresa Rudolph, viola, Emmanuelle Beaulieu Bergeron, cello, and Samuel Banks, bassoon, in Mozart’s Sonata for Bassoon and Cello K292, Devienne’s Quartet for Bassoon and Strings Op.37 No.3 and Andrew Norman’s string trio, The Companion Guide to Rome. Mar 10: Bravo Niagara! Festival of the Arts presents the exceptional pianist Jan Lisiecki. Mar 18: Salzburg-born-and-raised cellist Clemens Hagen (of the celebrated Hagen Quartet) and Russian-born American, multi-faceted pianist Kirill Gerstein perform three of Beethoven’s five cello sonatas, Op.5 No.2, Op.102 No.1 and Op.102 No.2 as well as his 7 Variations in E-flat Major on “Bei Männern, welche Liebe fühlen” from Mozart’s The Magic Flute; presented by the Royal Conservatory in Koerner Hall. Mar 22 to 24: In “Sound and Colour: Scriabin and Synesthesia,” Art of Time artistic director, pianist Andrew Burashko, performs Scriabin’s 24 Preludes in conjunction with lighting designer Kevin Lamotte’s light-field show. Mar 23: Belgian pianist Olivier de Spiegeleir adds his own commentary to his Debussy recital presented by Alliance Française de Toronto, 100 years after the composer’s death. Apr 6: The Royal Conservatory presents “Bernstein @ 100,” featuring German pianist Sebastian Knauer, Jamie Bernstein (Leonard Bernstein’s daughter), mezzo-soprano Wallis Giunta and the ARC Ensemble. How does it happen that a young conductor from Birmingham, UK makes his Canadian debut leading the Kitchener-Waterloo Symphony in a pair of concerts? How is it that a young Taiwanese-American violinist makes his Toronto debut at Mooredale Concerts? And what accounts for a young German-French cellist making his Toronto debut at Koerner Hall? The coincidence of three emerging young professionals all arriving in our area over the next few weeks sparked the above questions (and several more). Their answers in a series of emails mid-January were as diverse as their backgrounds but all shared the common thread of personal connections. Alpesh Chauhan, the 27-year-old conductor from Birmingham, told me that his management are on very good terms with the management of the Kitchener-Waterloo Symphony and keep in touch sharing information on their clients. The invitation to guest conduct on February 9 and 10 developed out of interest on the orchestra’s part; a grateful Chauhan attributes it to strong trust between the parties. Versatile soloist and chamber musician, 35-year-old Nicolas Altstaedt, was chosen by Gidon Kremer to succeed him as artistic director of the Lockenhaus Chamber Music Festival; and he was selected by Adam Fisher to follow him as artistic director of the Haydn Philharmonic. Altstaedt spoke to RCM executive director Mervon Mehta, who books their concerts at Koerner Hall, in March of 2016 when the cellist visited Toronto with his friend and sometime chamber music partner, violinist Vilde Frang, who was giving a recital at Koerner Hall at the time. Altstaedt expressed his desire to play there and the confluence of this season’s cello series and Mehta’s familiarity with pianist Fazil Say (Altstaedt’s collaborator) sealed the deal for the March 2 recital. Alpesh Chauhan: Chauhan first discovered classical music at school, when a cello teacher performed in his school assembly in Birmingham. He was instantly hooked, and went home later that day with a cello under his arm, much to the surprise of his parents who were born in East Africa (father in Tanzania and mother in Kenya) of Indian descent (Gujarati). He became increasingly passionate about classical music throughout school and later studied cello at the Royal Northern College of Music, while at the same time conducting friends in concerts he arranged for charity. “That was my first real conducting experience and I knew it was something I wanted to pursue,” he said. “I quickly grew an obsession with the people at the front, and the sound they created from the podium. Next, I asked each musician to comment on the repertoire they will be performing. AC: We have a great program for my KWS debut. A flashy overture by Magnus Lindberg, Aventures, which quotes many popular classical music works including Prokofiev’s Classical Symphony and even Berlioz’s grand fantasy-themed Symphonie Fantastique which we perform in the second half of the concert. In between we’re joined by pianist André Laplante for Beethoven’s Fourth Piano Concerto. I have a long relationship with the Berlioz as I conducted rehearsals as an assistant in Birmingham, went on to assist it a couple of times in my time at the CBSO and then conducted it in Scotland in 2016 in a program that also included Debussy’s La Mer! PH: In general for my recital programs, I want to give audiences a variety of musical styles and a sound world palette which the violin is able to convey. For this program with my duo partner Helen Huang, we will be bringing the Dvořák Sonatina, a piece which Dvořák wrote while in America but very much had nostalgia towards his roots, with several joyful Czech dances throughout the movements. The Prokofiev F-Minor Sonata is perhaps one of the darkest sonatas ever written (like a Russian epic novel). It was written during WWII, a sonata that almost in a way documents history through the notes. In the second half we have prepared two miniature pieces (Sarasate and Kreisler) to lighten up the mood from the dark first half and make a transition to the finale of the program, which will be the colourful and brilliant Saint-Saëns’ Violin Sonata, a piece that is very dear to my heart. I concluded my virtual symposium by asking each musician the question: What do you find most rewarding and most challenging in your professional life? AC: I think one of the most important elements of my professional life is the musical and emotional reward I enjoy when playing and conducting live music. The most challenging, however, is the travel and unsettled lifestyle, which can be very tiring. I also find constantly changing repertoire to be a challenge! For example, the week before I conduct the Kitchener-Waterloo Symphony, I will be in Italy conducting Shostakovich 11. I’ll then travel straight to KWS for Berlioz Symphonie Fantastique, followed by the Netherlands to conduct Tchaikovsky 4 and then back to Italy for Shostakovich 10! PH: Very often when I get together with musicians we ask each other is all the stress, travelling, hours of practising, the nerves of getting on stage night after night, is this really worth it? But the answer at the end is always yes. Because when I see people coming up to me after concerts telling me how much they enjoyed the evening or sometimes how it made their lives more meaningful or even made some positive impact in their lives, for me, that’s what makes everything worth it. I believe music is the most wonderful and powerful way of bridging different roots, different cultures, different languages, different religions and different backgrounds. In the world of music, we are all on this wonderful musical platform where we are all the same and can share something in common and can understand and respect each other on a much deeper level. NA: It is very rewarding to spend your life communicating with people in the most diverse and powerful language. I am very aware and grateful for that every day. I am currently working on The Seasons by Haydn and it has been a revelation. The same goes for pieces I have already performed like the concertos by Dutilleux and Dvořák and the complete Bach Suite Cycle, that I am playing the following week. To be in touch and discover artworks that widen your awareness on a daily basis is the most wonderful thing to grow in life. Last month I did a Q&A with pianist George Li whose Toronto debut recital in Koerner Hall on February 4 has been postponed with no new date announced as of press time. The Q&A prompted a comment by New England Conservatory visual assets manager Andrew Hurlbut who pointed out that Li’s musical education owed a great debt to the NEC and to his studies with Wha Ryung Byun as part of the NEC/Harvard dual degree program. “It seems to me that long through line in his training is at least somewhat responsible for his current well-deserved success,” he wrote in an email. We appreciate and welcome the comments of readers far and wide. Feb 5: The Kitchener-Waterloo Chamber Music Society is taking full advantage of charismatic clarinetist Dionysis Grammenos’ stint as assistant conductor for the COC’s production of Mozart’s The Abduction from the Seraglio. K-WCMS is connecting him with the popular piano quartet, Ensemble Made in Canada, for a performance of Brahms’ Clarinet Quintet Op.115, another exquisite work from the composer’s last creative output. The performance will be repeated Feb 7 in Toronto as part of the COC’s free noontime concert series. Feb 11: Anyone who was fortunate enough to experience the electricity of Stravinsky’s Petrushka at David Jalbert’s and Wonny Song’s duo piano Mooredale Concerts recital January 14 need not be reminded of Jalbert’s next appearance in our area. For his K-WCMS solo concert, the Ottawa-based virtuoso will burnish his reputation as one of Canada’s finest pianists with three Prokofiev sonatas – Nos. 2, 3 and 5 – on the same program. Feb 15: TSO principal violist Teng Li brings her warmth and sensitivity to a program of transcriptions by the celebrated 20th-century violist William Primrose in a free noontime recital at U of T Faculty of Music’s Walter Hall. Lydia Wong is the collaborative pianist. Feb 22: Music Toronto presents the Apollon Musagète Quartet in a program of Haydn, Arensky and Grieg. The dynamic young Polish quartet made a memorable debut in the Jane Mallett Theatre in November 2015 and their return is eagerly anticipated. Feb 25 and 26: Canzona Chamber Players give us another chance to hear Brahms’ great clarinet quintet (along with with Hindemith’s) with Canzona co-founder Jonathan Krehm joining Csaba Koczo, Jessica Tong (violins), Robin Howe (cello) and Pocket Concerts’ Rory McLeod (viola). Mar 1: Lang Lang, recovering from tendinitis in his left arm, will share the keyboard with 15-year-old Maxim Lando (a Lang Lang International Music Foundation Scholar) in a piano four hands arrangement of Gershwin’s exuberant Rhapsody in Blue. Peter Oundjian conducts the TSO. The extra coverage in this double issue of The WholeNote has prompted me to consider its entire nine-plus weeks of listings as fodder for constructing my personal musical winter wonderland. You are welcome to come along for the ride! On thewholenote.com I find the LISTINGS tab and click on the indispensable JustASK feature. It’s early in planning my journey so I opt to see the entire listings for the first week in December. (Later in my wanderings, to refine my search I may choose to JustASK specifically for chamber music or piano.) In this case, I decide on a free RCM event, pianist Francine Kay in a Sunday Interludes recital at Mazzoleni Hall on December 3. Chopin’s Barcarolle has always been a personal favourite and its rolling rhythms will get my festive juices running. Besides, the eminent Princeton University faculty member (and Analekta recording artist) will be giving two masterclasses the following Friday in the same space. Depending on what the students will be playing, I may sit in. Sorry to say, you’ll have to JustASK for yourself for the balance of December. That’s because my annual visit to longtime friends in the cabin they built themselves in the middle of a hundred-acre wood will take me through the month. A festive Christmas feast of turkey and trimmings baked in a wood stove will serve all of us well while a curious, sociable parrot provides live entertainment. Martha Argerich debuted at four, Claudio Arrau at five. Ryan Wang at ten has been on the stage for half his life. The Li Delun Music Foundation presents him on January 4 at the Fairview Library Theatre in recital playing Bach’s French Suite No.6 – his Bach on YouTube is refreshingly without any affect – a Haydn sonata, a Poulenc Villageoise, Debussy’s Arabesque No.1, the two Chopin Waltzes Op.64 and a Bartók Romanian Dance. An excursion to North York may be a New Year’s resolution worth keeping. Two days later, January 6, Wang is the soloist in Beethoven’s Piano Concerto No.2 with the Toronto Festival Orchestra conducted by Dongxiao Xu in the Li Delun Music Foundation’s “New Year’s Concert 2018” at the George Weston Recital Hall. January 7, Rachel Barton Pine: She began learning the violin at three; at five she “self-identified as a violinist.” At ten, she performed with her hometown band, the Chicago Symphony Orchestra; at 17, she won the Bach International Competition in Leipzig, Germany. At 20, her violin case straps caught in the closing doors of a Chicago commuter train; the accident cost her part of a leg and mangled a foot. Her determination and discipline from her years of violin study brought her all the way back musically. On January 7, she performs the first Sunday Interludes concert of the year in Mazzoleni Hall. January 10 to 21, Mozart @ 262: I’m back on Bloor again for some of this next part of my private winter festival. I am about to come face to face with the TSO’s Mozart @ 262 Festival that begins January 10; it will be the TSO’s 14th annual celebration of that prodigy’s genius, and the final one with Peter Oundjian (the festival’s creator) as TSO music director. Roy Thomson Hall (three performances), Koerner Hall (two) and the George Weston Recital Hall (one) will all be involved. On January 17 and 18 concertmaster Jonathan Crow and principal violist Teng Li will be the soloists in Mozart’s Sinfonia Concertante for violin and viola K364/320d in what might very well be the single highlight of the festival. January 11, Brentano and Dawn Upshaw: I plan on abandoning Mozart to take advantage of a rare opportunity to hear Schoenberg’s pivotal String Quartet No.2 when Music Toronto presents the Brentano String Quartet and soprano Dawn Upshaw in the Jane Mallett Theatre. Completed in 1908, the quartet’s extreme late-Romanticism loses its harmonic bearings by its final movement, a change that can be considered the beginning of atonal music. The third and fourth movements are settings of poems by the symbolist poet Stefan George. Alex Ross in The Rest Is Noise talks about the extraordinary moment in the fourth movement when the soprano sings the line I feel the wind of another planet and then the “transformation,” I dissolve in tones, circling, weaving … The Schoenberg is preceded by Respighi’s intimate, lyrical setting of Shelley’s Il Tramonto. Before intermission, the Brentano (without Upshaw) will interweave Webern Bagatelles with Schubert Minuets before performing Argentine-American Mario Davidovsky’s String Quartet No.4 (1980), a piece I look forward to hearing for the first time. The next morning, January 12 at 10am, Upshaw will give a masterclass in Mazzoleni Hall. I’ve marked my calendar. Maybe I should just move to Bloor Street! January 23, Stephen Hough: In October 2016 the brilliant British pianist Stephen Hough revealed on BBC Radio 4’s Desert Island DIscs that he discovered he liked playing the piano when he went to visit his aunt’s house and could pick out more than one hundred nursery rhymes on her piano. After much pestering, his parents bought him a cheap second-hand piano from an antique shop. So began the storied career of this polymath, whose first novel, The Final Retreat, is to be published in March 2018. On January 23, he makes his fourth appearance for Music Toronto since 1996 with a program mixing four Debussy works (two of which, Images Bk 1 and II, appear on his latest Hyperion CD, anticipating the centenary of the composer’s death in 1918) with Schumann’s rapturous Fantasie Op.17 and Beethoven’s colossal Sonata in F Minor, Op.67, “Appassionata.” The next morning, Hough will make the trek north to Mazzoleni Hall for a public masterclass. Having been to two of these, I have no doubt it will be an insightful and inspirational experience. January 27, the Dover Quartet: The Dovers came to wide attention in 2013 when they won the Banff International String Quartet Competition. I wrote about their memorable Beethoven concert at Toronto Summer Music in 2016: “Musically mature, vibrant and uncannily unified in purpose and execution, the youthful players brought passion and grace to the first two movements [of Op.132], took a decisive approach to the fourth and emphasized the rhapsodic character of the finale.” Chamber Music Hamilton, a top-flight regional series, is presenting the young Americans in a recital of Schumann’s Second, Ullmann’s Third and Zemlinsky’s Second String Quartets, Sunday January 27 at 2pm at the Art Gallery of Hamilton. January 30, RCM and Hot Docs Ted Rogers Cinema (although the name has changed, the address remains Bloor Street) present Stefan Avalos’ compulsively watchable Strad Style, a film I saw at Hot Docs 2017. The documentary chronicles the improbable but triumphant story of a reclusive Ohio violin maker, Daniel Houck, whose confidence that he can produce a copy of “Il Canone,” the Guarneri violin built in 1742 that Paganini played, carries him through an eight-month journey that threatens to be derailed more than once. A violin aficionado who loves listening to old masters like Oistrakh and Heifetz and idolizes violin makers Amati, Guarneri and Stradivari – all from Cremona, Italy – Houck suffers from bipolar disorder but functions with medication. He befriends Razvan Stoica on Facebook when he discovers the Romanian-born violinist has won the Strad Prize at a Salzburg festival and offers to make him the Canone replica. There is magic stuff here. After the screening Jonathan Crow will bring out his own Guarneri for what promises to be a fascinating show-and-tell Q&A. And that’s why I’ll be there. And on into February: The astounding young pianist Daniil Trifonov continues his homage-to-Chopin tour February 1, with a sold-out concert at Koerner Hall. 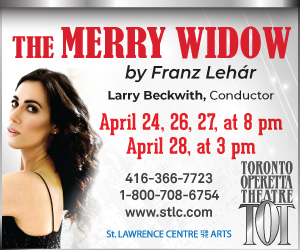 I’m lucky to have a ticket but unlucky to miss the St. Lawrence String Quartet’s annual Music Toronto visit the same evening. Fortunately I can attend the SLSQ’s masterclass in Mazzoleni Hall the next day at 10am. In 2008, clarinetist Dionysis Grammenos became the first wind player ever to be named European Young Musician of the Year. Two years later at 21, having been guided by Bernard Haitink, Christoph Eschenbach and Robert Spano, he made his conducting debut with the Vienna Chamber Orchestra. Johannes Debus hired him as assistant conductor for the COC’s 2018 production of Mozart’s Abduction from the Seraglio February 7 to 24. “You find in him a musician who exudes an enthusiasm for music from every single pore and who equally has the talent to communicate and share his enthusiasm and euphoria with others – no matter if it’s about an audience or fellow musicians,” Debus says. Grammenos’ appearance at noon on February 7 in the Richard Bradshaw Amphitheatre with Ensemble Made in Canada (they will perform Brahms’ late masterpiece, the sublime Clarinet Quintet in B Minor Op.115) is the last stop in my winter festival. Given the abundance of live music available to all of us in the Toronto area, there’s an ad hoc personal winter festival out there for the making for every musical taste. How? JustASK. Mai Tategami began studying the violin at the age of six. As an orchestral player, she was concertmaster of the Seiji Ozawa Ongaku-juku Orchestra and became an academy student and temporary contract member of the Rundfunk Sinfonieorchester Berlin (2012-2015). During the 2015/16 season, she performed with the Beethoven Orchester Bonn as concertmaster. At 28, she won the first edition of the Orford Music Prize in 2016. She makes her Toronto debut with a free Music at St. Andrew’s noontime recital on November 24 and follows that up November 26, when she joins the Rebelheart Collective in Mooredale Concerts’ third program of the season to play the second violin part for a performance of Mendelssohn’s exuberant String Quintet in B-flat Major, Op.87. I asked when she knew she would devote herself to music and she told me that there had been two turning points in her life. When she was 12 years old she had to choose which private junior high school to get into. One was the best junior high school in the Osaka/Kobe area, but to get in there she would have had to go to cram school and give up on playing the violin as a professional player. The other was the academy connected to her elementary school. To enter it no cram school was necessary so she could continue practising the violin as much as she wanted. Her other dream was to be a lawyer and to pursue that dream she would have had to go to the best school and forgo studying the violin altogether. After much self-examination, she realized she couldn’t imagine her life without playing music so she decided to go to the academy which would allow her to study and play violin. “I think it was the first decision I made to devote my life to music,” she said. I asked how winning the Orford Music Prize had changed her life. She was playing in the Beethoven Orchester in Bonn, Germany at the time, she told me, but winning the prize gave her opportunities to play solo and chamber music concerts in Asia and Canada, so she quit playing in the orchestra and concentrated on her music, studying again to get ready for her next step. “I think it was one of the biggest decisions I have made in the past few years,” she said. Debargue and his cohorts, Dutch violinist Janine Jansen, Swedes Torlief Thedeen (cello) and Martin Fröst (clarinet), have been on a mini-trans-Atlantic tour since recording the Messiaen earlier this year for SONY (release date is November 3). Beginning at the end of May in Stockholm, they’ve performed the Quartet to great acclaim in Wigmore Hall, London and the Verbier Festival, Switzerland. A concert in Quebec City takes place on December 4, the day before their Koerner Hall performance December 5. An appearance in Zankel Hall, Carnegie Hall wraps it up December 7. Jansen, incidentally, is the Perspectives Artist at Carnegie Hall this season. The North American tour’s program begins with Bartók’s Contrasts for violin, clarinet and piano, commissioned in 1938 by Joseph Szigeti and Benny Goodman. Bartók downplayed the piano part as if in deference to the skills of his commissioners but played up the three instruments’ differences in timbre. There is a 1940 recording of the three of them available on YouTube. Szymanowski’s incandescent Mythes for violin and piano completes the first half of the recital. The Women’s Musical Club of Toronto’s Career Development Award (CDA) is presented every three years to an exceptional young Canadian musician (or small ensemble) embarking on a professional performing career. The winner gets $20,000 and the opportunity to give a recital in the Music in the Afternoon concert series. The process for choosing the 2018 CDA winner is now well under way with the recent announcement of the ten candidates under consideration. Five of them are likely familiar to our readers: Toronto native, mezzo-soprano Emily D’Angelo, well-known to local audiences, took a giant international step forward in March 2016, when she was one of five winners of the 2016 Metropolitan Opera Auditions at 21. Violinists Boson Mo and Blake Pouliot and pianists Mehdi Ghazi and Tony Yike Yang are also familiar fixtures here. Now, on November 4 and 5, another of the CDA candidates gets an opportunity to make his mark in the GTA. Timothy Chooi is the soloist in Bruch’s hugely popular Violin Concerto No.1, a piece that unabashedly wears its heart on its sleeve; it promises to be a highlight of the Oakville Symphony Orchestra’s “50th Anniversary Fireworks” program. The 46th season of Music Toronto is well under way with four concerts taking place under the umbrella of this issue of The WholeNote, beginning with pianist Benjamin Grosvenor’s highly anticipated return to the Jane Mallett stage on November 7. On November 16, Britain’s brilliant Anglo-Irish quartet, the Carducci, will fly in especially to perform a heavyweight program -- Beethoven’s Quartet No.11, Shostakovich’s Quartet No.4 and Debussy’s Quartet in G Minor -- following the unexpected cancellation (for medical reasons) by the Škampa Quartet. Described by The Strad as presenting “a masterclass in unanimity of musical purpose, in which severity could melt seamlessly into charm, and drama into geniality,″, the internationally-known Carducci Quartet studied with members of the Amadeus, Alban Berg, Chilingirian, Takács and Vanbrugh quartets. A Toronto solo piano recital debut by Timothy Chiu, who is profiled elsewhere in this issue, follows on November 28. And finally the Gryphon Trio, now in its 23rd year, makes its annual Music Toronto visit December 7 with a typically diverse program of Haydn, Mozetich and Brahms. Nov 5: Nocturnes in the City presents the eminent Czech violinist Ivan Zenaty (who continues the Czech violin tradition he learned from his mentor Josef Suk) in works by Franck, Tchaikovsky and Dvořák (with pianist Dmitri Vorobiev). Nov 5: Trio Arkel (with guest, cellist Shauna Rolston) paints a musical picture of Russia in the years before the Revolution: Taneyev’s Trio for Strings (1907), Arensky’s Cello Quartet (1894) and Cello Duos (1909) by Glière. Nov 9: Women’s Musical Club of Toronto presents the Zodiac Trio in a recital geared to their unusual makeup: piano, violin and clarinet. Formed in 2006 at the Manhattan School of Music under the guidance of famed clarinettist David Krakauer and Beaux Arts violinist Isidore Cohen, the trio has made a career out of their unique sound palette. Nov 12: Pocket Concerts’ ebullient co-directors, pianist Emily Rho and violist Rory McLeod, in a rare duo recital, play music by Kenji Bunch, Brahms and Rachmaninoff. Nov 15 and 16: Peter Oundjian leads the TSO in an all-Vaughan Williams program showcasing orchestra members Sarah Jeffrey (oboe) and Teng Li (viola) as well as Canadian superstar Louis Lortie (who also gives a solo recital Nov 19 at The Isabel in Kingston). On Nov 23 and 25, Deutsche Oper Berlin general music director Donald Runnicles leads the TSO in Mahler’s biographical Symphony No.6, a massive work the composer wrote as an answer to Strauss’ Ein Heldenleben. Joshua Bell began taking violin lessons when he was four years old after his mother discovered that he had stretched rubber bands across the handles of his dresser drawer to pluck out music he had heard her play on the piano. Several decades later in January 2007, Bell performed incognito as a busker at a public transit station in Washington DC. More than 1,000 people passed by but only seven stopped to listen. He collected $52.17 from 27 people (including $20 from the one person who recognized him). Now in his 50th year, the celebrated American virtuoso returns to Toronto for a recital in Koerner Hall on November 4. The program, with the gifted Italian pianist, Alessio Bax, includes sonatas by Mendelssohn, Grieg and Brahms, as well as additional works to be announced from the stage. But the concert is sold out (one of several in that category this season) so unless you’re already a ticketholder (or one of the fortunate few able to secure rush seats on the day of the recital), you’ll miss the chance to hear the musician who has become only the second music director (after Neville Marriner) of the Academy of St. Martin in the Fields chamber orchestra. Still on the subject of the Royal Conservatory’s new season, making their Canadian debut October 20 at Koerner Hall, the Khachaturian Trio (pianist Armine Grigoryan, violinist Karen Shahgaldyan and founding member, cellist Karen Kocharyan) has been active since 1999, taking the name of their Armenian countryman Aram Khachaturian in 2008. Their handful of recordings focus on the music of Armenian modern composers as well as Khachaturian, Tchaikovsky, Arensky, Babadjanian and Shostakovich. The program for their Toronto recital includes Tchaikovsky’s intense, demanding, symphonic Piano Trio in A Minor, op. 50, “In Memory of a Great Artist”; Rachmaninoff’s Trio élégiaque No. 1 in G Minor, the composer’s personal memorial to Tchaikovsky whom he called the most enchanting of all the people and artists he had ever met (“His delicacy of spirit was unique.”); Khachaturian’s Adagio of Spartacus and Phrygia from Spartacus Suite No. 2, Op.82b (the music for the Spartacus ballet from which this suite was taken is among Khachaturian’s most acclaimed works); and Babadjanian’s richly romantic, melancholic Trio in F-sharp Minor. As Toronto audiences have come to recognize from the many appearances in the recent Toronto Summer Music Festival by the concertmasters of Canada’s two major symphony orchestras, Jonathan Crow of the TSO and Andrew Wan of the OSM, the two are consummate, generous musicians dedicated to conveying their joy in the music they play. And despite their considerable commitments to their principal orchestral roles, they still find time to come together for several concerts each season with the New Orford String Quartet, where they alternate in the first and second violin positions. Such is the case when the U of T Faculty of Music presents the New Orford on October 5 in Walter Hall. Ravel’s wistful, melancholic String Quartet in F Major, arguably the most performed string quartet of the 20th century, shares the stage with Tchaikovsky’s moving String Quartet No.3 in E-flat Minor and Steven Gellman’s Musica Aeterna (1994). Faculty of Music free noontime concerts continue on October 19 with Crow joining his colleague Joseph Johnson, TSO principal cellist, to play music of Ravel and Kodály. Johnson’s TSM Shuffle Concert last August was enlightening and entertaining, with the personable cellist’s onstage patter illuminating his impeccable playing of selections from Bach’s solo cello suites mixed in with works for two, three and four cellos! Brooding, intense and sedate Bach contrasted with showpieces featuring Viennese musical twirls and swoops and Lisztian Hungarian rhapsodies, all smoothly led by Johnson at his collaborative best. On October 30 Johnson teams up with the Gryphon Trio’s pianist, James Parker, in a U of T recital at Walter Hall with a substantial program comprising Debussy’s rapturous Sonata in D Minor, Beethoven’s densely packed, forward-looking Sonata No.2 in G Minor, Op.5 and Brahms’ bold and passionate Sonata No.2 in F Major Op.99. Crow and Johnson’s day jobs with the TSO find them supporting Marc-André Hamelin in Ravel’s ingenious one-movement Concerto for the Left Hand on October 25 and 26. It was the most successful of the works commissioned by Austrian pianist Paul Wittgenstein after he lost his right arm during World War I. When Wittgenstein first saw the long solo cadenza that opens the piece he said: “If I wanted to play without the orchestra, I wouldn’t have commissioned a concerto.” But Ravel refused to change a note. When I spoke to Hamelin last winter he confirmed my suspicion that Ravel’s one-movement concerto in D Major was a piece he really enjoyed playing. “Very much so,” he told me. “Although I’ve also for the first time recently played the G Major [in Montreal with the OSM and Kent Nagano]. Can you believe? And that’s worked out well. I would like to offer a program in which I play both in a single evening. Which is perfectly fine.” Indeed, that would be quite a program. This time, however, under the baton of visiting Spanish conductor Juanjo Mena (principal conductor of the BBC Philharmonic), the TSO program is augmented by the Canadian premiere of Alberto Ginastera’s expressionist, dance-driven Ollantay, inspired by a pre-Columbian Inca poem and sounding like Aaron Copland’s music transposed to the Argentine landscape. Mena’s Chandos recording of this and other Ginastera works is considered by its publisher Boosey & Hawkes to be definitive. The major work of the evening is Schubert’s Symphony No.9 “Great,” an extensive melodic and rhythmic quilt that deserves its apt nickname. Schubert began writing the symphony in the year after he heard Beethoven’s Ninth and inserted a quote from the Ode to Joy melody into the middle of the last movement of it. See if you recognize it when you hear it.